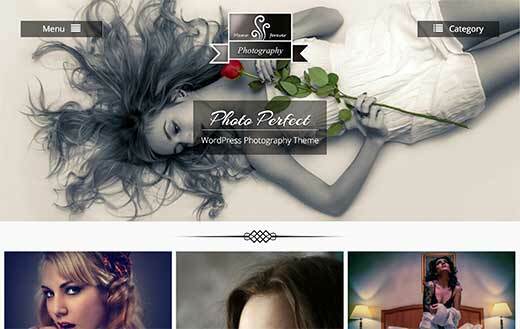 Are you looking for best free WordPress photography themes for your website? WordPress is used by thousands of photographers, designers, and artists from all over the world to beautifully display their portfolio and photos. In this article, we will show you 40+ best free WordPress photography themes that you can use on your website. 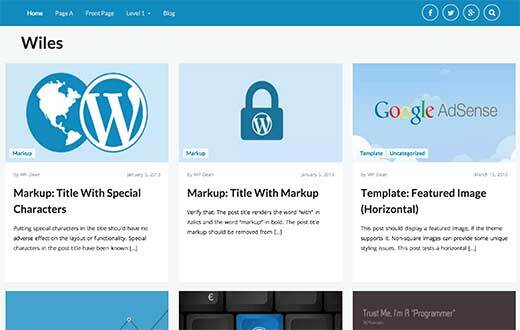 Before we begin, take a look at our guide on how to select the perfect theme for WordPress. It will help you understand the things that you should look for in a WordPress theme. 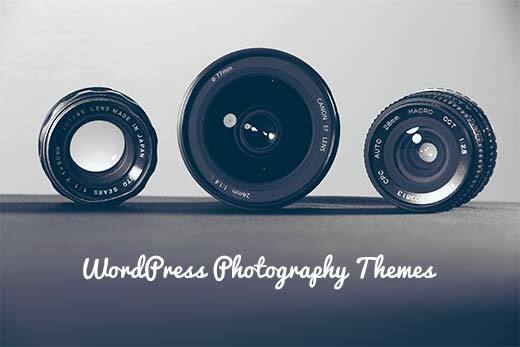 Having said that, let’s take a look at some of the best free WordPress photography themes. 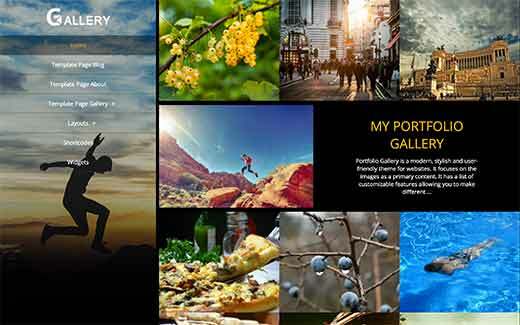 Portfolio Gallery is a fully responsive and free WordPress photography theme. It comes with multiple page templates and a lightbox popup to display your photographs beautifully. 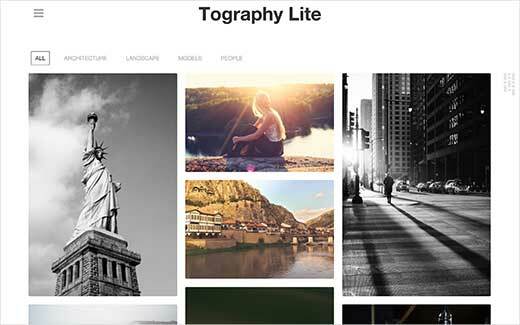 This aptly named theme is a fully responsive WordPress photography theme. It comes with built-in full screen slider to display your photographs on your homepage. 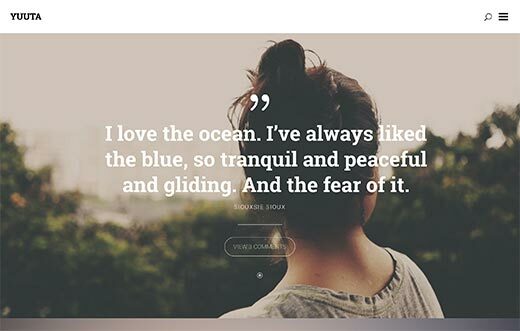 Topography is a beautiful free WordPress theme designed for photography blogs. It features a minimalist design with focus on images and typography. 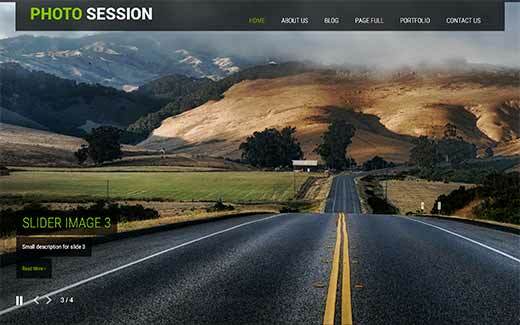 As the name suggests, Photo Session is a fully responsive free WordPress photography theme. It comes with a full screen slider and compact navigation menus. 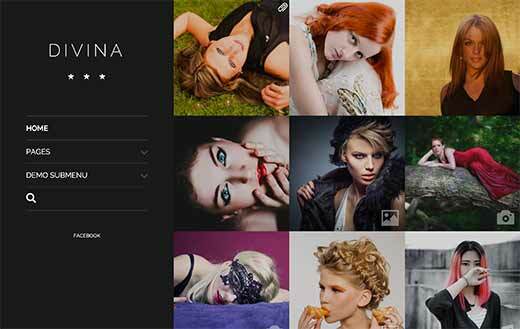 Divina is a modern WordPress free photography theme. It comes with a side header which also acts as your navigation menu and sidebar. It gracefully disappears on mobile and tablet devices. Divina is perfect for photographers, fashion blogs, modeling agencies, etc. 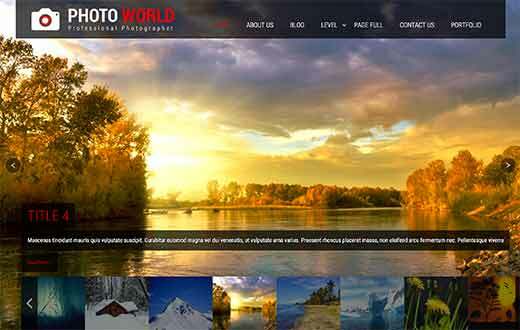 Photo World is a fully responsive and WooCommerce ready photography theme for WordPress. It comes with a full screen slider on the homepage with thumbnail displays. 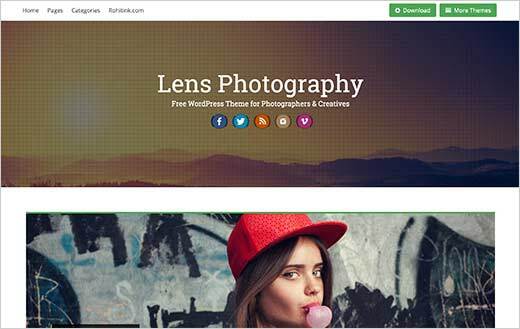 Lens is a responsive WordPress theme with ideal for photographers, designers, and advertisers. It comes with beautiful gallery layouts, about page template, and social menu. 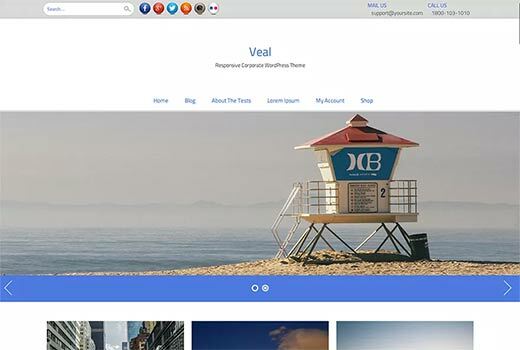 Veal is a simple WordPress theme designed to showcase images and galleries. It is a multi-purpose theme and can be used with almost any kind of WordPress site. With a minimalist design approach, Patio is a responsive WordPress theme for photographers and designers. It uses the built-in featured images to curate your homepage in a beautiful responsive layout. 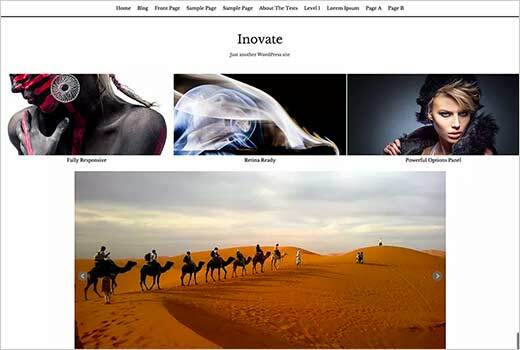 Inovate is a very simple blog theme with focus on usability. It comes with showcase template that allows you to beautifully showcase your photographs, images, and other works. 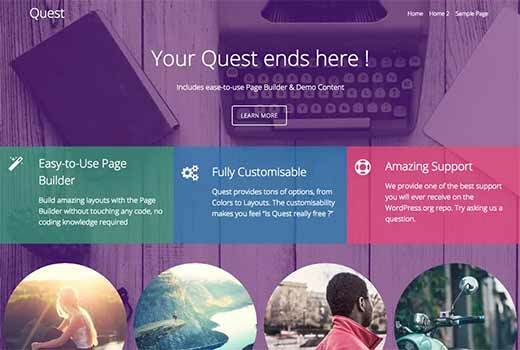 Quest is a powerful and modern multi-purpose WordPress theme. Its flexibility allows you to use it for a portfolio or photography website as well as a business website. It is colorful and highly customizable. 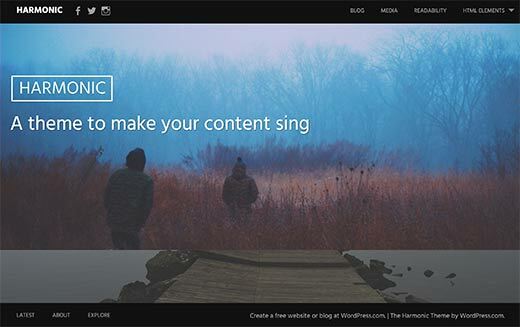 Harmonic is a beautiful WordPress theme with fullscreen images. Ideal to display your photographs, portfolio, or use it for travel or fashion blog. 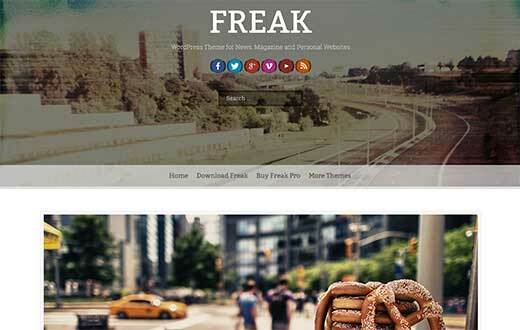 Freak is an elegant WordPress theme with a beautiful parallax header. It comes with a built-in responsive slider, large featured images and multiple page layouts. 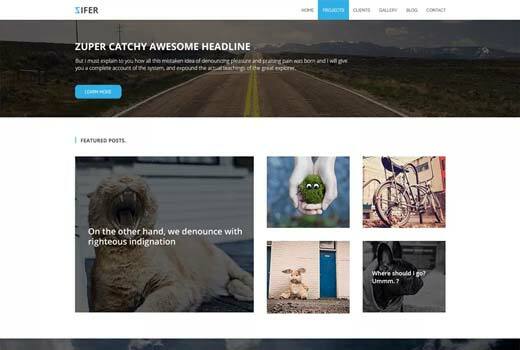 Zifer is a child theme of Zerif Lite. It is designed to be more focused on photography and portfolio websites. It looks stunningly beautiful on all devices. 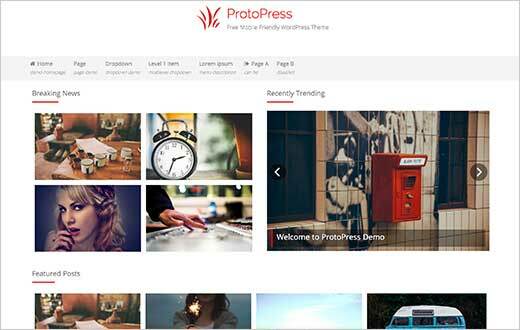 ProtoPress is a designed for portfolio and photography websites. It is a powerful theme with loads of options. It features multiple layouts, featured content areas, showcases, fully configurable sidebar width, slider with 3D Effects, Google Fonts, etc. 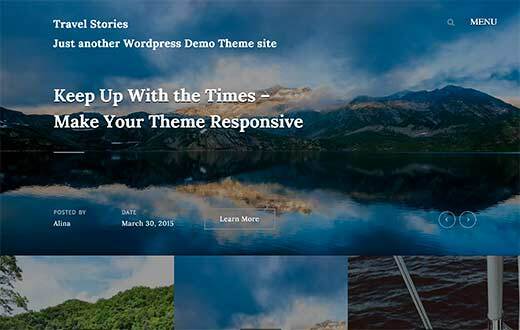 Yuuta takes a very visual yet very simplistic approach to WordPress photography theme. It comes with multiple styles for different post formats. Ideal for photo blogs and visual diaries but can easily be used for other kind of websites as well. Adirondack comes with a beautiful grid layout that makes it a perfect choice for photography websites. It features large images, beautiful typography, home and blog layouts along with the standard WordPress theme features like custom menus and background. 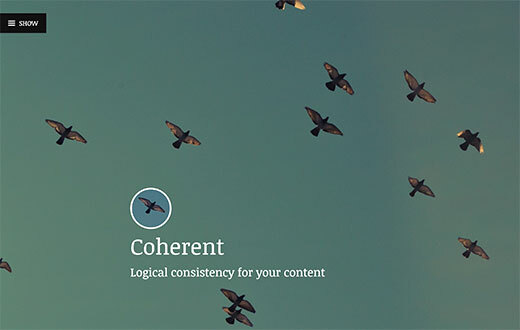 Coherent is a stunning WordPress theme with fullscreen header images and beautiful typography. It features a compact navigation menu, social menu, sliding panel, among other standard features. 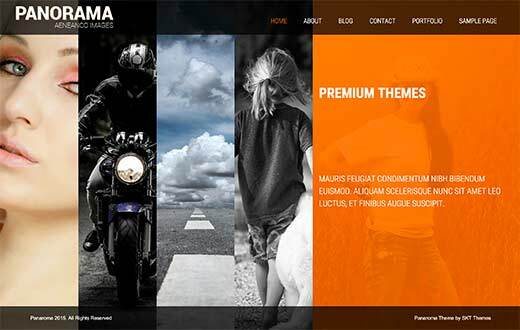 An extremely easy to use WordPress theme. 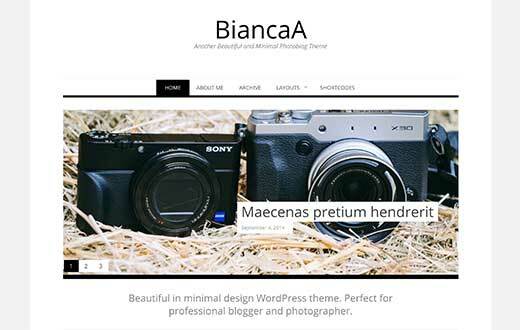 Bianca is a minimalist WordPress photography or portfolio theme. It is mobile-ready and looks great on all device sizes. 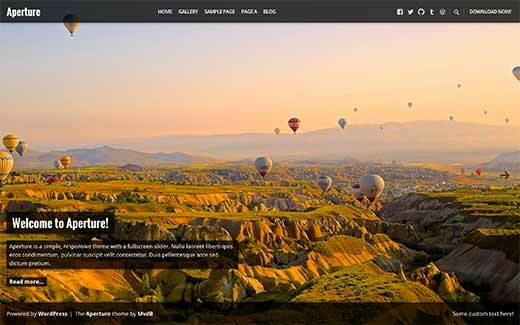 SG Window is a highly customizable theme for photography or travel websites. It is fully responsive and features a homepage with grid layout. It has multiple sidebars, page templates, and custom widgets. 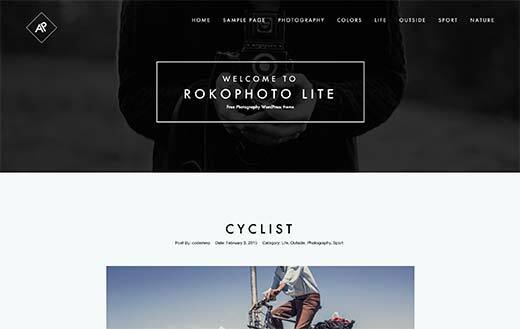 Rokophoto lite is a theme designed for photo bloggers. It focuses on visual appearance of your images as well as your content. It has a minimalist design approach that looks very elegant and soothing. Stained Glass is a feature rich and highly customizable theme. It comes with multiple sidebars and you can choose the layout from theme customizer. You can choose four column-grid layout for your blog and archive page. 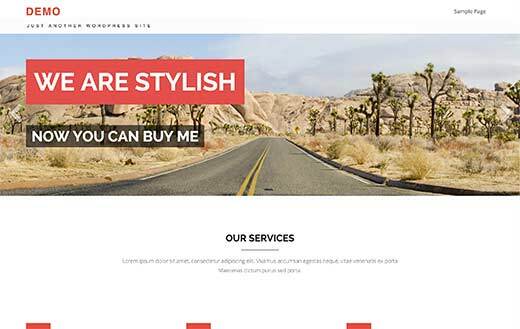 Avnii is a bootstrap based fully responsive WordPress theme. It has easy customization panel, multiple color schemes, a built-in slider, and multiple page templates. 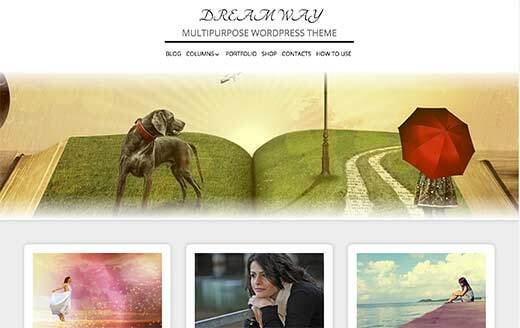 It is a multi-purpose theme, which means you can use it for any kind of WordPress site. Dream Way is a child theme of SG Windows (mentioned above). It inherits all the features of the parent theme with its own style. Dream way has multiple layout choices like right sidebar, left sidebar, or three column layouts. It also supports WooCommerce and can be used on eCommerce websites as well. 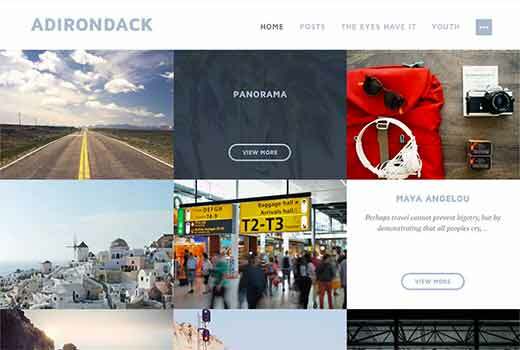 Panorama is a stunningly beautiful WordPress photography theme. It features large sliders that takeover the homepage and provide a very interactive and engaging user experience. The blog and archive pages feature the usual blog layout. Create a stunning portfolio or photography website with Jax Lite, a minimalist and stylish WordPress theme. 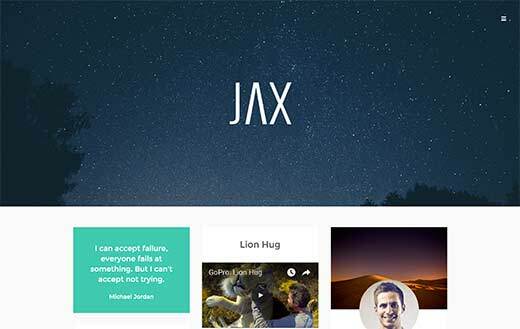 Jax Lite features a masonry grid layout with a large parallax background in the header. It has a compact navigation menu that works great on both mobile and desktop devices. Eryn is a fresh beautiful theme with main focus on personal blogging. It features a two column layout with a large background for the header column. It is fully responsive and has a compact navigation and search bar. 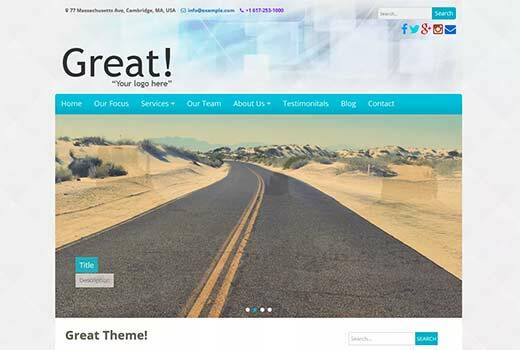 Great is a multi-purpose WordPress theme with lots of customization options. 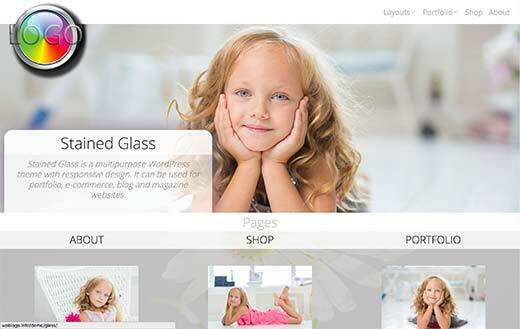 It has a beautiful homepage layout which makes it ideal for a photography website. It has custom header, custom background, multiple page layouts, social menus, contact info, and multiple widget ready areas. Photo Perfect is a photography theme ideal for fashion photography, ad agencies, and modeling agencies. 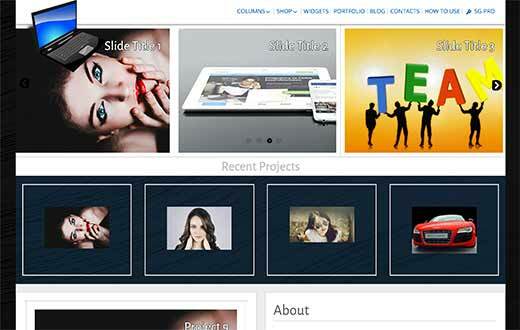 The theme features large images, grid layout, slider, and compact menu. 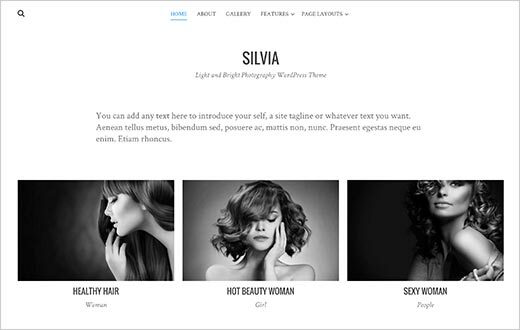 Silvia is a minimalist style photography WordPress theme. It is designed with a focus on photography, graphic design, fashion, art, architecture, interior design, and other creative fields. It is fully responsive, retina-ready, and SEO-friendly. 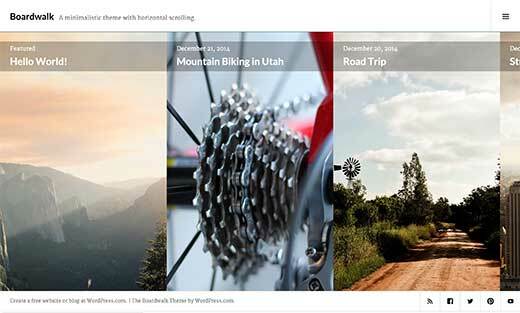 As the name suggests, Travel Stories is a WordPress theme focused on story-telling, travel, and photos. It has a very visual style with the focus on photographs as the most visual content on the screen. 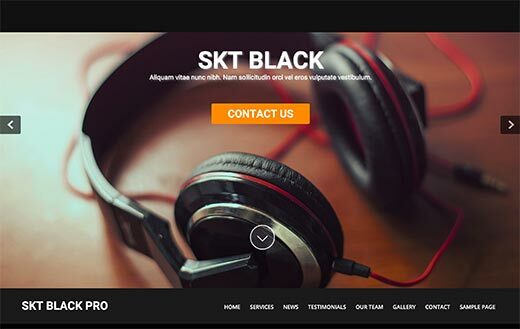 SKT Black is a multi-purpose WordPress theme with loads of customization choices. It uses a full screen slider on the homepage and grid based layout which makes it a great choice for photography websites. 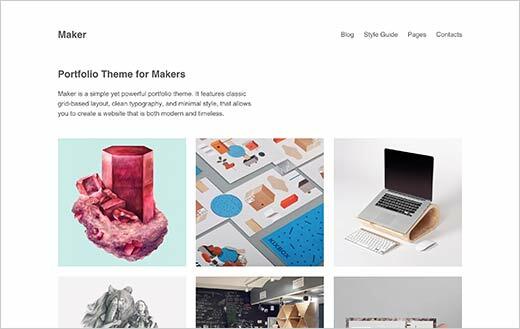 Maker is an elegant and minimalist WordPress photography theme. With lots of white space and grid based layout it creates a very interesting and simplistic feel. It is very easy to setup and customize. 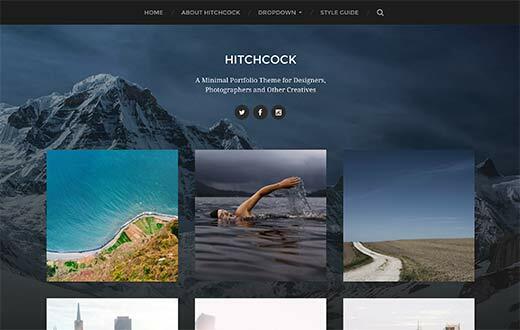 Hitchcock is a visually stunning WordPress photography theme featuring a full screen parallax background. Large featured images and compact menus make your photographs pop out. 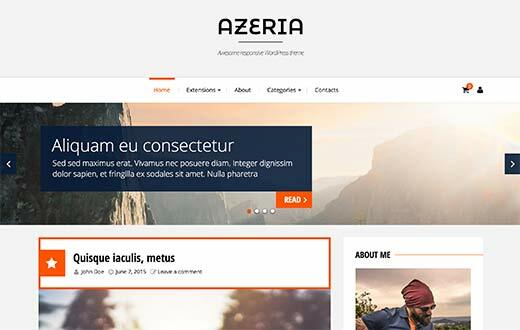 Azeria is a simple blogging theme with minimalist design approach. It is fully responsive and supports all the standard WordPress features such as custom background, header images, large featured images, responsive layout, etc. 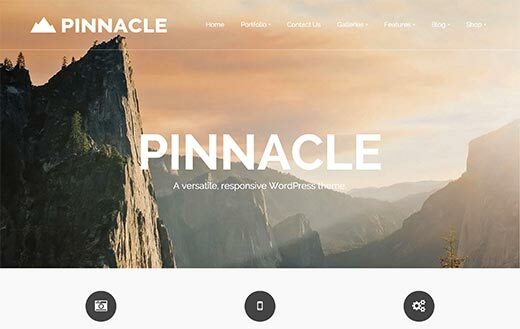 Pinnacle is a bold multi-purpose WordPress theme. It is loaded with features and comes with easy customization options. 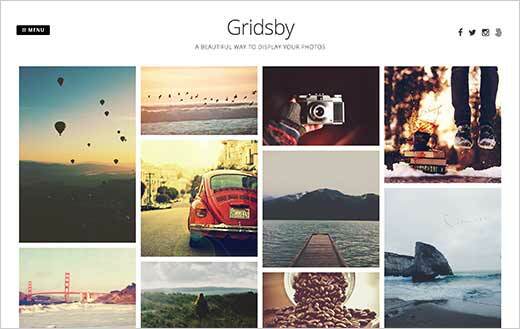 Gridsby is a beautiful grid-based WordPress photography theme. It uses masonry layout grid with a compact navigation menu and a social menu. This gives prominence to your photographs. It is very easy to setup and comes with all the standard set of features. Boardwalk is an elegant and WordPress photography theme with minimalist design approach. It features horizontal scrolling which makes it quite engaging and beautiful for photography and other visual content. Wiles is a simple blue WordPress theme. It uses featured images and excerpts for the grid based layout on the home, archive, and blog pages. 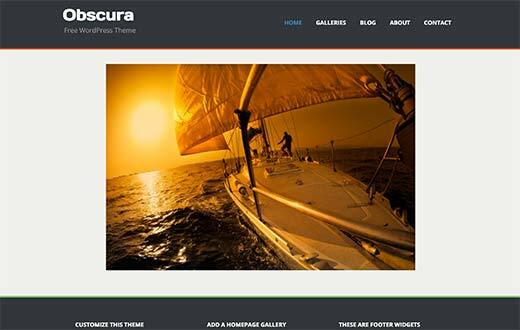 A classy, clean and simple WordPress theme, Obscura features large featured images and a beautiful two column layout. 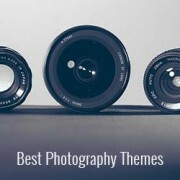 Designed for photography themes, it can also be used as a multi-purpose theme. 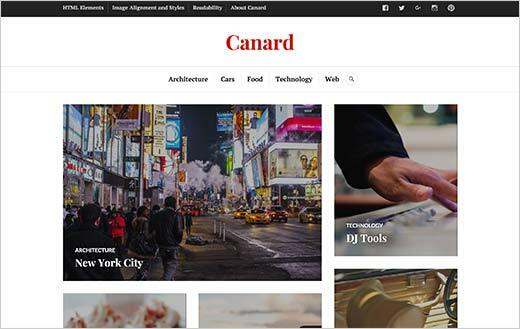 Canard features three navigation menus, and a beautiful grid based layout. It is designed to elegantly display your photographs, art, and other visual content. It supports all the standard WordPress features, with easy customization options and fully mobile-responsive. 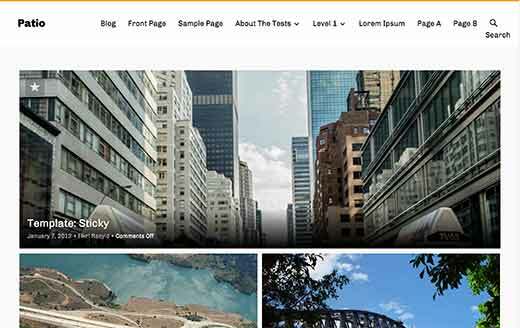 We hope this article helped you find the best free WordPress photography theme for your website. You may also want to see our guide on how to easily create beautiful responsive image galleries in WordPress with Envira. I like them. Beautiful and responsive. liked it!!!!! hope to try in future!!!! Theme 5: Divina seems to be broken, regards. Please report the error you see to the theme author. Portfolio Gallery and Gridsby are great themes. Morning, thank you for this article. I am currently running the blog theme chicago. First I would like to ask if this is a photography blogging theme? Then if I wanted to change to one of the Themes you have shown how would I go about that? Are these paid for themes? If I am unable to change my theme, is there a way that I can make the display of my images larger/wider?